The L-1 has beautifully clean aesthetic lines. A very large elegant rewind knob folds over into the top plate. The three position non-brightline non-parallax corrected finder is controlled by the serrated wheel near the rear eyepiece. The finder position is shown on the "35, 50, RF" scale on the top plate. The RF increased magnification position roughly corresponds to a 135 lens. The L-1's gold coated rangefinder usually stands the test of time rather well, better than the silver coated rangefinder in the later Canon VI, VI-T, and P. It's a very pleasant camera to shoot. 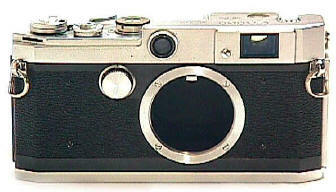 The shutter has separate low and high speeds, with the high speed dial rotating in traditional Leica tradition. This also allows for easy double exposures, just rotate the shutter speed dial back until it locks and is ready for another shot. 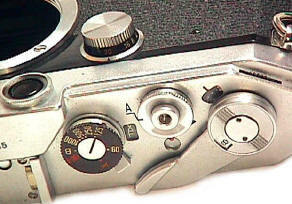 The lever mounted around the high speed shutter dial controls the synchronization setting for flash or flash bulbs. The AR collar around the shutter release is the film rewind switch. The film counter is manually set, controlled by the serrated wheel just below and to the right of the film advance. Like the other Canon V, VI variants, the L-1 has a nice film indicator transport just in back of the shutter release. Shutter range is a conventional 1-1/1000th plus B, T, and X (at 1/50th). The most interesting L-1 feature is just barely visible here -- the round ball in the middle front of the accessory shoe. This is a rather amazing device which was share by the rest of the Canon V/VT family -- automatic viewfinder parallax correction! So far as I know, these Canons are the only cameras to have such as feature -- too bad Leica did not copy it. It takes a special series of finder which mate to the ball in the accessory shoe. As you focus, the ball goes up or down, compensating for parallax. Compared to the various bottom trigger advance Canon V and VI, I find the L1 much more comfortable to use. While detachable Leicavit style trigger advances have their useful place, in non-detachable form they become a problem due to their always added weight and bulk, not so great tripod handling, and inability to follow moving action (you need a 3rd hand to focus while your left hand advances the film and your right hand releases the shutter)..
Canon RF models are a bit confusing, with many variations being considered a separate model. Ironically the lower production and less featured L2 and L3 are worth more than L1's in today's collector's market. The L2 has a top speed of 1/500th, knob rewind, and flash sync for flash bulbs but not flash. The L3 is a L2 with no flash sync. After Canon switched to a silver coated rangefinder and stainless steel shutter curtain in the VT Deluxe, two lever advance cameras continuing the L-1 genre were produced on the VT Deluxe theme. These L-1 look-alikes are the VL with a top speed of 1/1000th and the VL-1 with a top speed of 1/500th. Black Canon Rangefinders are as rare and desirable as Black Nikon Rangefinders. 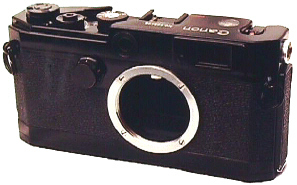 Unlike many Canon rangefinders, the L series were all clearly marked on the baseplate. Want more info on Canon Rangefinders? Buy Peter Dechert's book Canon Rangefinder Cameras 1933-1968 and Peter Kitchingman's book Canon M39 Rangefinder Lenses 1939-1971. Which Canon Screw Mount Body is Best Overall ? I've owned all of the Canon Rangefinders models after the IVSB. By far my personal favorites are the L1 and 7s. I would have liked the bottom wind Canons if they had offered top wind as well. I've seen such a modified camera on ebay. Trigger wind alone was just too awkward. The L1 got it right with a 3 position viewfinder, lever wind, accessory shoe parallax, and a GOLD RF patch. The gold patch is important because the later silver RF patches of the various V and VI models usually self disintegrated over time becoming quite flare prone. The P was OK, but often flares too much, making the L1 a better choice. 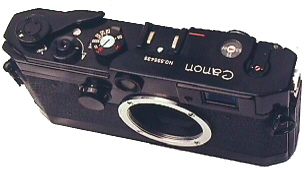 The P also lost the previous Canon's unique accessory shoe parallax button for automatically controlled accessory finders. The 7 had all the 35 to 135 framelines, but suffered from a clumsy meter that practically never works and having no accessory shoe. Worse than that, stylistically the 7 is simply an ugly camera compared to its stable mates. The 7s overcame all the problems of the 7, but is still not as well made as the L1 when you compare the side by side. Still, it is hardly a bad choice. Like their Nikon brothers in arms, all of the LTM Canon RF's are more reliable than Leica M3 or M2, needing both CLA's and shutter replacements about 1/4 as often as Leicas in my experience. Revised: June 21, 2015 . Copyright � 1998-2015 Stephen Gandy. All rights reserved. This means you may NOT copy and re-use the text or the pictures in ANY other internet or printed publication of ANY kind. Information in this document is subject to change without notice. Other products and companies referred to herein are trademarks or registered trademarks of their respective companies or mark holders.